After several unfinished jams, i finally released completed game! 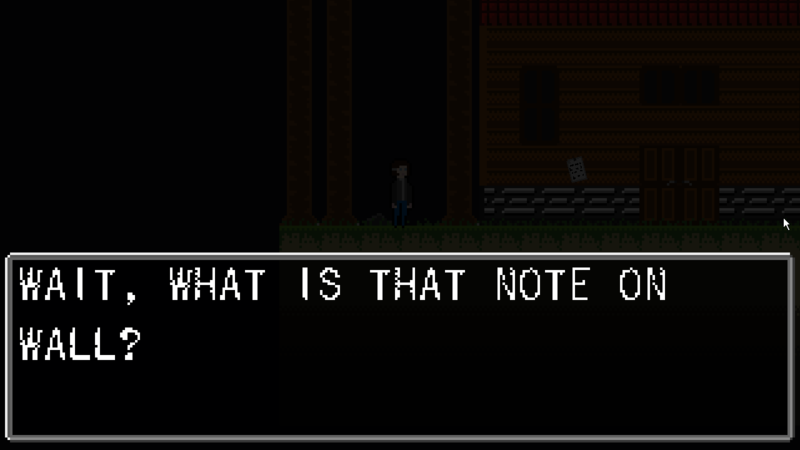 It is small “horror” adventure about guy who hates humanity! Hiaaa, i still don’t have any story! (which is pretty important for adventure game) So i at least created main menu! If you guys have any tip for good horror story / manga /movie for inspiration, let me know! Everything what i done today is seen in jiff! 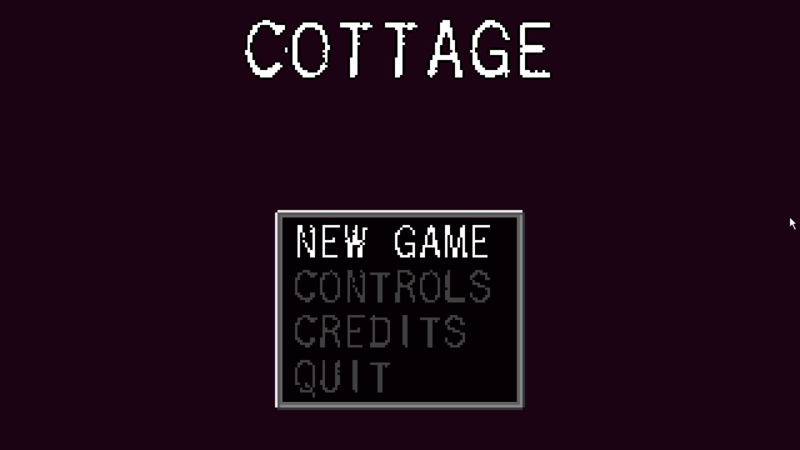 COTTAGE – DEVLOG NUMBER … four? Thank you guys for helping with light! Thanks to that, i finally finished lighting. Also, i redrawed main character! 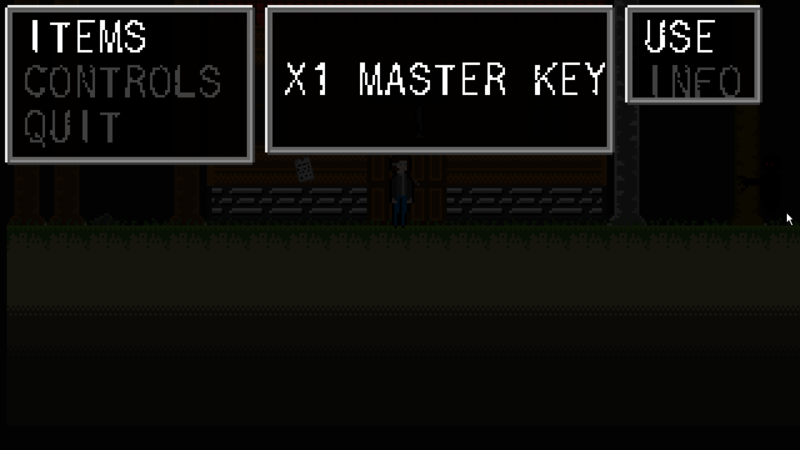 Another thing which i finished is dialog system! So you can talk now! Here is some little magical moving picture. Yesterday i writed, and writed, and writed…! And that’s not all! I also finished drawing of tileset and building of areas! And, now my obligatory question! 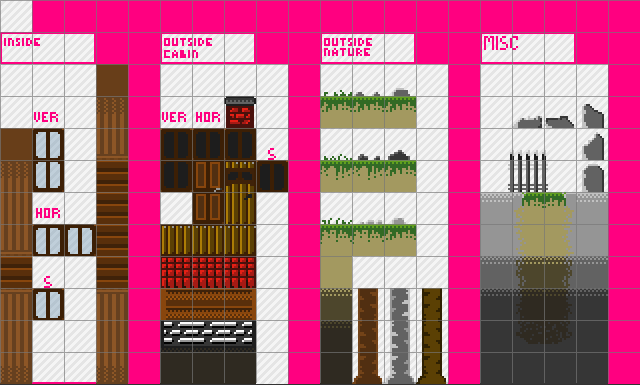 As i mentioned before, i am idiot who deleted his main character animations… So, meanwhile i trying to restore deleted files, i started to draw some tilesets. And it looks like i am finished with basic inside and outside enviroments! And what will be next? Well… I have still 2 hours left until recovering program finishes scanning. So i probably start to creating levels! Soo.. I was so proud for myself! I created main hero even with animation with just sprite editor in GM! Theen, i decided to start new file and actually forgot i don’t have pyxel file 😀 Sooo… Bye bye main hero! I still trying to use Recuva for finding lost sprites but i am not sure if i made it. (21% and over 300k files. Png and one folder only…) Wish me luck guys! You was betrayed by humanity! So, you decided to move to small cottage in the woods. You decided to build your own small world. World without humans. World without betrayal. But… After few days, you figured out one weird thing. You are not alone! Now, you must defend your small world! Aaaand, here is some making of! This time how i drawed and animated main character. 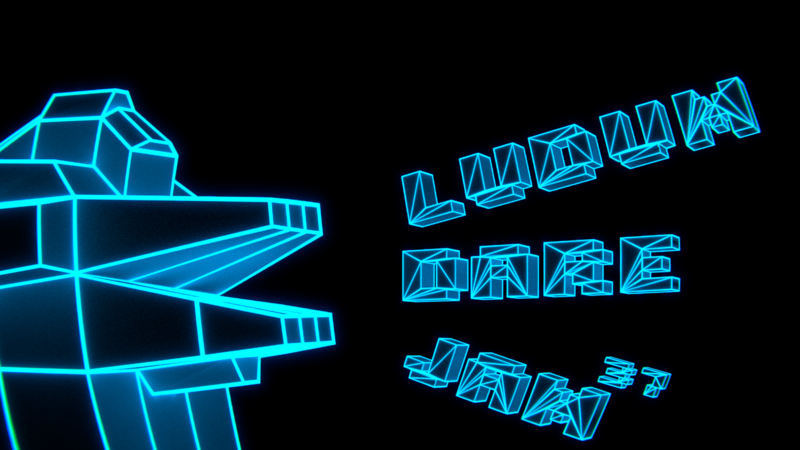 It was really time consuming so i am not sure if i release another videos before end of this LD. Also, check original post on LDJAM site! Today, facebook reminded me some old ld pictures. Sadly they was on puu.sh so… Deleted. After that i started looking for alternative and found amazing software called SHAREX. It makes same things like puu.sh buth with much more features and settings (like choose where you want upload your images / files / texts. Also it have cool gif recording tool! So, i just want to share this with others! Aaaand again! My least favourite theme won! 😀 But i think after some with i will figure something! But now something about me! Pyxel edit and paint.net (maybe little bit of gimp or blender. Depends on style) for graphic. ORIGINAL POST ON LDJAM SITE Please consider making updating posts here too! This is third time in a row! 😀 And why? Well… My idea was again too complex for one man army like me. Also, i recently got repaired my Nikon D3100 So… Sorry guys. Next time i will surely make amazing game with (i hope) GMS2. Feel free to use those photos or others from my gallery. Here is some sneak peek. As i said before, i started pretty late so i am not sure if i make it. BUT! I just completed 1/3 core mechanics called “Life support”. So… Now i can enjoy watching how my character dies by hunger or thirst or just simply by owerwork. Now i need to start building “edit” mode. How will edit mode works? Well… While scavenging you will find various items and you can place them in your room. Every item will have durability and you will ned collect scrap for repairing. Stay tuned! In my next (and probably last devblog) I will wrote more about scavenging system! I started pretty late this LD and i probably did not make it to the end. But i don’t give up yet! I at least created base mechanics (player moving). And started to working on core gameplay mechanics. I planning to make survival game. You are in world filled with zombies and you must manage your needs, AND your room because you have only limited free space. If you don’t have supplies which you need, you can go scavenging. I have this mechanics just on paper. 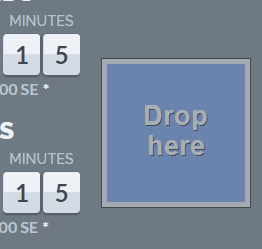 You can choose how many hour you will scavenge. More hours = more rare items but bigger chance of wounding and killing yourselves. And more rare items, more room they will need. Well, you need to manage few things. Mental health is very important part of game. You need to stay in good mental state. If is your mental state too low, you will commit sucide. You can scavenge and use items like newspapers (less space but only one use) or (for example) Wash mashine (you can use it every day but you will need much more space..
Hi, i am in again! And, here is some wallpapers which i made! Click on image for full res! In last post i asked for some tips for games. I got 5 so… There are my reviews! I put those games because both developers get exactly same idea 😀 Games are about call centers in old times. You just connect jacks to holes. This idea is great for mobile gaming! If one of them make android version, i will probably play it evere free time in bus! Buuut…. I liked Operator more. Better sounds and more realistic. Good small games! Without flaws or bugs but also without some catchy game mechanics. I really can’t say too much about this game 😀 Not because is bad, but because i thought it will be about pc and floppy disk but there was pretty funny plot twist so, enjoy it yourself! So, thankies for tips! If you are developer and want feedback written in horrible english, just leave comment! I still have mood for some horror stuff though… But i play everything! 32 queries executed in 0.140 seconds.